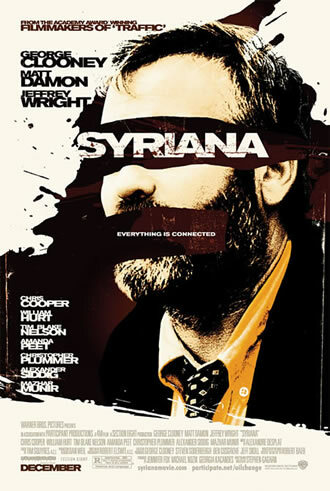 Syriana, the movie that won George Clooney the best supporting actor Oscar for his portrayal of a CIA agent, chillingly dramatises the merging of the state and the corporations, which is one of the chief characteristics of this period of globalisation. It is a drama being played out all over the world – in the Congo, for example, where western governments foment violence and arm warring factions, whilst the corporations carry on stripping the country bare without reference to issues like who owns the land and precious raw materials. In the former Soviet Union, the last of the world’s crucial energy supplies are being carved up between corrupt Mafia-style governments and oil corporations happy to swop paltry bribes for super-profits. The film itself features a shady “Committee to Liberate Iran”, and just such forces are currently pushing for a violent intervention there too. One of the most ambiguous characters is high-flying lawyer Bennett Holiday, excellently played by Jeffrey Wright (who also delivered a great performance in the Oscar-winning Best Film Crash). He’s investigating the background of a small oil company lined up for merger with his law firm’s global oil client. He must find if there’s evidence that this small outfit’s spectacular success in a former Soviet republic was won by corruption. Not that this would halt the merger, you understand, but just to make sure nobody important goes to jail. The outcomes of these machinations are felt far away, in the Middle East, where lives are transformed by corporate conspiracies and state-sponsored dirty tricks. Syriana is apparently a term used by Washington think-tanks to describe a hypothetical reshaping of the Middle East. And a very violent reshaping it is proving to be, with the price paid by the poor and dispossessed, as the film quite effectively shows. Clooney’s world-weary Bob Barnes, a CIA field agent who has lived so long in the Middle East he almost merges with the sand, is the link between the other key characters whose lives are changed - Matt Damon’s ambitious but idealistic oil industry analyst, protégé of an Oxford-educated “Saudi” prince (Alexander Siddig) and at the bottom of the ladder, a young Pakistani oil worker labouring in the Gulf (Sahid Ahmed). The newly-merged oil company is determined to overturn Prince Nasir’s decision to award a huge contract to a Chinese firm. He wants a deal that will enable him to improve the lives of his own people. Back in the US, it’s clear that, for reasons of business and state, any action is acceptable to prevent this attack on US and corporate interests. Violence, bombings, coups, torture and martyrdom are the result. And when things go wrong Bob Barnes finds himself the fall-guy which leads to a dramatic switching of sides. Describing the plot and the final, terrible dénouement would take longer than it would take you all to go and watch this great film. The terrible thing is, it is all entirely believable in a world where Prime Minister Blair and President Bush wage war for Haliburton and Texaco. The transformation of two young men into potential suicide bombers is a very serious attempt on the part of a Hollywood movie to show both their humanity and the real reasons for their tragic transformation. The Oscars were dominated by films with a serious content, from best film Crash, an exposé of LA racism and corruption, to Clooney’s Good Night and Good Luck, a clarion call to US journalists to show a bit of back-bone in relation to the Bush government. Brokeback Mountain, though not directly political, was a stark reminder of the days when to be gay was to be illegal, and still today to risk violence and discrimination. And Capote, too, is political in its own way, with its critique of the death penalty. Syriana is a film not to be missed and along with these other movies, it heralds a significant political change brewing in the United States.